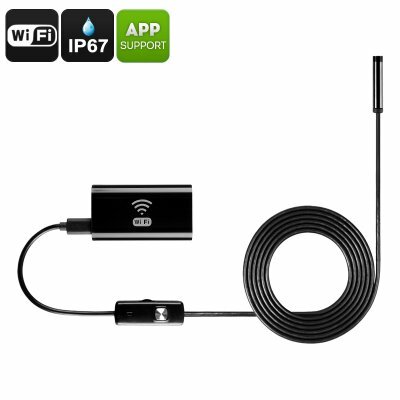 Successfully Added Smartphone Endoscope - 2 Meter, WiFi, IP67 Waterproof, 720p Resolution, 8mm Diameter, 6x LED, 70-Degree Viewing Angle, 600mAh to your Shopping Cart. This smartphone endoscope measures nearly 8mm in diameter. Thanks to this ultra-thin design, the endoscope is capable of entering the smallest places where regular cameras can’t reach. It furthermore comes with 6 LEDs, allowing you to use your HD endoscope at places with limited natural light. Whether you use it for laying cables in your home, inspecting tight places, or for checking whether you’ve dropped something behind your sofa – this 2m endoscope brings along countless of possibilities. Thanks to its efficient usage, it is the perfect electronic gadget for plumbers, technicians, engineers, as well as for people working in countless other industries that often find themselves in tight situations. With its intergraded camera, this HD endoscope is capable of delivering clear 720p footage. When used with the dedicated mobile application, you’ll be able to follow the video stream live on your smartphone – providing you with a clear view of that’s what happening in those places your eyesight can’t reach. The smartphone endoscope can be used with both Android and iOS smartphones for extra efficiency. Coming with a 600mAh battery and WiFi connectivity, this HD endoscope can be used without external power supply for up to 45 minutes – making it a great tool for anybody’s tool box. Thanks to its tough and waterproof IP67 design, you will be able to use this smartphone endoscope in every imaginable occasion. Coming with an abundance of useful gadgets such as a little hook and magnetic tip, the possibilities this endoscope offers truly are limitless. Pull cables, check out tight places, or retrieve fallen objects from below the sofa – there is nothing this cool electronic gadget can’t do. This smartphone endoscope is the perfect tool for anybody out there that wishes to simplify their lives without spending unnecessary large amounts of money on the latest gadgets and gizmos. This smartphone endoscope comes with a 12 months warranty, brought to you by the leader in electronic devices as well as wholesale electronic gadgets..